Seatbelts and airbags in cars save passengers lives. Parachutes save people who, for a variety of reasons, exit a plane in mid-flight. So why aren't parachutes provided to passengers on commercial airline flights, in case of emergencies? Because they almost certainly would not save anyone's life. When your average daredevil skydives for fun, the plane is typically travelling at between 80 and 110 mph when the skydiver jumps.Tandem and accelerated free fall (AFF) jumps occur between 10,000 and 13,000 feet, while static jumps can be as low as 3,500 feet. Student divers choosing the easiest, tandem jump, where the newbie is physically and securely attached to an experienced instructor, are still required to undergo "a half hour of basic ground instruction." Four to five hours of intense ground instruction, including learning body flight maneuvers and hand signals that instructors use to coach the student as they fly alongside. For an AFF jump, although not harnessed together, freshman flyers are accompanied by two instructors who "hold onto the student's harness until" it's deployed. Those who choose a static line jump also have to take four + hours of training prior to the jump, although the parachute is deployed as the rookie flyer leaves the aircraft. When skydivers leave a plane, they do it alone or in small groups. When successive groups will be jumping, they try to keep separated by anywhere between 500 and 1500 feet; this is often accomplished by waiting until the preceding group is "back under the tail to 45 degrees behind the airplane" or several seconds in between groups. Experienced skydivers can make even riskier jumps, although when descents begin at higher than 15,000 feet, "the risk of hypoxia and being significantly affected by altitude" increases dramatically and divers are less able "to make effective safe decisions at critical times." Therefore, divers who jump from 15,000 feet or higher carry supplemental oxygen. Further, each parachute weighs around 40 pounds and the equipment is expensive. To be fully outfitted with "rig, main, reserve, ADD, altimeter, jumpsuit, helmet [and] goggles" can run between $5,900 and $9,000. Perhaps the most popular commercial jetliner is the Boeing 737 family. Its 737-800 can carry nearly 200 people (including the crew). Although speeds can vary slightly, the 737-800 travels at approximately 600 mph when at its cruising altitude of 35,000 feet. Cruising altitudes are assigned by air traffic controllers and are usually up to 39,000 feet, except for longer flights that may fly higher. Since four hours of training just to board a plane is unrealistic, passengers would have to read and execute detailed skydiving instructions including how to properly strap the chute on in order to benefit from the parachute. Not everyone is good at following detailed, technical instructions even when time and stress aren't a factor. In a situation where the plane is going down and one has only a moment to get the parachute properly strapped on (likely while keeping an oxygen mask firmly attached and perhaps also needing to keep the seat belt on to keep from being thrown about in the cabin), it's unlikely most would be able to even get this far. Unless passengers wanted to fly suited up and tethered for a static jump, parachuting from a commercial airplane will be an AFF jump; however, unlike the conditions that students get – training and trained instructors to assist, commercial passengers will just have to learn as they go. In addition, they will have to keep calm and proceed in an orderly fashion, which will require most to patiently wait their turn to exit. This is not likely to happen. Adding just parachutes (not counting helmets, altimeters, etc.) for each passenger would add another 8,000 pounds or so to the flight's weight. In addition, that equipment would take up space, that is already at a premium. The only feasible time for people to jump from the plane is while it's cruising. However, most fatal airline accidents occur on airplanes during takeoff and landing. Consider that between 2003 and 2012, only 9% of all fatal accidents on commercial flights, seven total, occurred while the plane was cruising; moreover, at least one of those accidents happened as a result of wind shear or thunderstorm. This is a situation where parachuting is extremely dangerous even if you're an expert. So even if parachuting were feasible from a jetliner, the conditions in which parachutes could theoretically save lives are almost never apparent in fatal commercial accidents. But even if they were, it still wouldn't be a good idea. At 35,000 feet (three times higher than a typical jump) every passenger would need high altitude equipment (HALO) that includes an oxygen tank, mask and regulator, flight suit, ballistic helmet and altimeter just to manage the thin air. Or they could just pass out from hypoxia and wake up later, hopefully when the parachute automatically deployed at under 15,000-20,000 feet. Of course, none of this would matter since the plane is moving so fast (600 mph), and it is so large, that many passengers would almost certainly smash into it and suffer debilitating if not fatal injuries. There is hope, however. Over the past few years, many small planes have been equipped with whole-plane parachutes that slow the craft's descent. As of late 2013, the largest planes equipped with these safety devices carry five people, but plans are in the works for putting them on larger crafts. As one manufacturer said, "There is no doubt that big commercial airlines of the future will be equipped with some kind of parachute recovery system." Sit in the back with the cool kids. According to several studies, "passengers near the tail of the plane are about 40 percent more likely to survive a crash than those in the first few rows up front." The other advantage is that most passengers choose not to sit in the back. So unless the plane is full, you might get the row of seats to yourself. 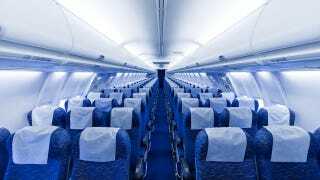 However, other research into surviving plane crashes indicated that "those [passengers] who sat more than six rows from an exit were found to be far less likely to survive." So if the plane doesn't have a rear exit, that's something to be factored in. If you do happen to fall out of a plane at 35,000 feet (without a parachute), Popular Mechanics has some advice on how to survive the fall: "The concept you'll be most interested in is terminal velocity. As gravity pulls you toward earth, you go faster. But . . . you [also] create drag . . . . and [eventually] acceleration stops. Depending on your size and weight, and [other] factors . . . your speed at that moment will be about 120 mph [this takes about 1,500 feet. At about 22,000 feet] You sputter into consciousness [hypoxia had knocked you out from shortly after you exited the plane]. . . . Take aim . . . . Glass hurts, but it gives. So does grass. Haystacks and bushes . . . and trees aren't bad, though they tend to skewer. Snow? Absolutely. . . . Contrary to popular belief, water is an awful choice [to cushion the fall]. . . . With the target in mind, the next consideration is body position. To slow your descent. . . spread your arms and legs, present your chest to the ground, and arch your back and head upward. . . . Relax. This is not your landing pose. . . . . [To land, assume] the classic sky diver's landing stance – feet together, heels up, flexed knees and hips." According to the Geneva-based Aircraft Crashes Record Office, between 1940 and 2008 there were 157 people who fell out of planes during a crash and without a parachute and lived to tell about it. A full 42 of those falls occurred at heights over 10,000 feet! One such incident involved a British Tail-gunner whose plane was shot down in 1944 during WWII. He fell over 18,000 feet without a parachute. His fall was broken by pine trees and soft snow. After his "landing" he found himself completely fine, except for a sprained leg. Things didn't initially improve for him as he was quickly captured by the Germans. Apparently the Germans were more impressed by his near death experience than his nationality, because they released him the following May after having given him a certificate commemorating his fall and subsequent survival. Melissa writes for the wildly popular interesting fact website TodayIFoundOut.com. To subscribe to Today I Found Out's "Daily Knowledge" newsletter, click here or like them on Facebook here. This post has been republished with permission from TodayIFoundOut.com.